Snoy FE 400mm F2.8 GM lens is a large-diameter super telephoto lens G Master ™ “FE 400 mm F 2.8 GM OSS” with a focal length of 400 mm F value of 2.8. This new lens will deliver a new elevated shooting experience for all professional sports, news report and wildlife photographers who are looking for all of the decisive moments with higher image quality. 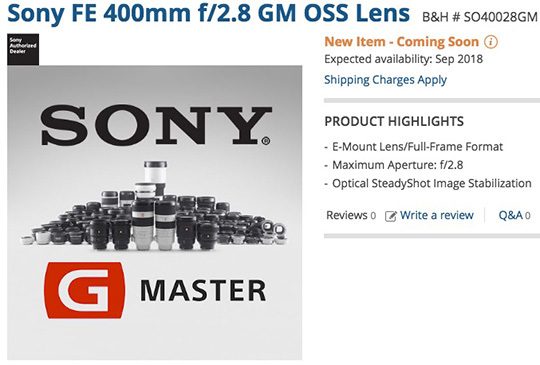 I would expect Sony to release the 400 F2.8 GM in the 1st quarter of 2018…not summer nor Sept 2018. After the A9 and A7 RIII releases, that’s way too long for pros to wait. Given the upcoming 2018 FIFA World Cup in Russia (June14 -July15) Sony should get this lens out with enough time to allow pros sport photographers the opportunity to switch over.